BECOMING PART OF THE VIEW: To avoid the crowds in leaf-viewing season, all you have to do is get out of your car. 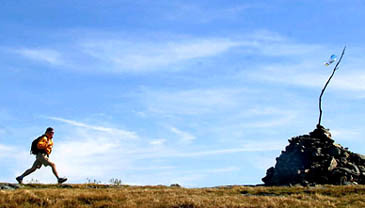 The barren summit of Brace Mountain on the South Taconic Trail is topped with a cairn and a windsock. On a recent weekend the Mount Frissell trailhead not far from Great Barrington, Mass., was quiet. Two cars sat idly at a small, dirt lot off East Street; a handful more lingered at a different trailhead a hundred feet down the road. Between them, a four-foot granite post engraved with Massachusetts on one side and Connecticut on the other stood in the shadow of an autumn-tinged maple. For a Sunday in early leaf season, things were exceedingly calm. "I don't think we're going to need a tent," said Paul Rice, an artist from New York City, as he rummaged through a backpack. His camping partner, Mary Anne Potts, also from New York, stared up at the bluebird sky and agreed. Indeed, the weather, a sunny 65 degrees with the crisp snap of fall in the air, was ideal for an overnight hiking trip. Mr. Rice lashed a ground cloth to the outside of his pack and look pleased. Save for the rustling of canvas and nylon, the only sound was the scraping of freshly fallen leaves along the gravel road. Leaf-peeping, as it's called by the locals, is an institution and an industry in the Berkshires. Each year, from late September to mid-October more than 300,000 visitors swarm across Western Massachusetts in search of vibrant fall colors. On weekends, when hotels fill and traffic backs up, those searching for a solitary glimpse of pastoral New England can be left disappointed, aggravated or both. But it does not have to be so. To escape the crowds, you merely have to escape the car. Of the area's leaf-season visitors, less than 1 percent come to hike in Mount Washington State Forest. Tucked in the southwest corner of Massachusetts on the border with New York and Connecticut, Mount Washington offers 30 miles of trails through the vibrant hardwood forests of the Taconic Range. The area has a fraction of the visitors to Mount Greylock, the region's most popular hiking destination, and has a biodiversity so rich it was named one of the world's "last great places" by the Nature Conservancy in 1996. PANORAMA: Connecticut, Massachusetts and New York meet in the woods. On the South Taconic Trail, the view sweeps from Massachusetts into New York. The reason Ms. Potts had come to Mount Washington for her annual dose of fall foliage was simple. "I'd much rather become part of the view than stare at it from the road," she said. With that, she and Mr. Rice saddled their packs and marched into the woods. Their plan was ambitious: five miles, three peaks and three states in one hike, followed by a night under the stars and a similar walk back the next day. In most mountains, such drive would be paid for in thigh-burning agony, but in the Taconic Range, a spur of the Appalachians that forms the western boundary of the Berkshires, it was quite realistic. With most of their summits under 2,600 feet, the Taconics are a playground for even the most novice of hikers. Peaks are climbed in minutes, not hours; views are gratifying and plentiful; and from any one point a road is never farther than an hour's walk. From East Street, the red-blazed trail led west toward Round Mountain, a 500-foot knob of rock that rises less than a mile from the road. Beginning abruptly in a warren of mountain laurel, the climb led up crumbling sections of schist and over exposed granite slabs in a tour of the area's 1.2 billion years of geology. Like many peaks in the Taconics, the top of Round Mountain is covered with a mixture of dwarf trees, blueberry bushes and grass. 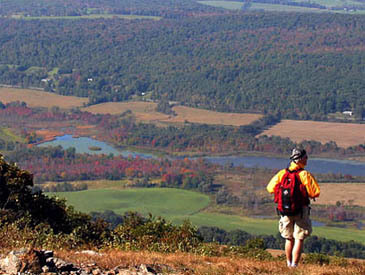 With nothing standing more than four or five feet, the views are unfettered: To the east, the ridge formed by Mount Race and Mount Everett dips down for a glimpse into the Housatonic Valley behind. At the mountain's base, East Street and the entire Mount Washington Valley lie hidden under a thick cover of forest — one that transforms each year with the chemistry of autumn. Though heavy rains caused by the remnants of the hurricanes that battered Florida have led some to predict a less-then-spectacular display this year, Lauren Stevens, locally known as the "leaf chief" who writes weekly foliage reports for the Berkshire Visitor's Bureau, doesn't expect that to be the case. "Last year, we had a lot of wind and the leaves were blown off early. But this year has been pretty mellow," Mr. Stevens said. "Unless something drastic happens, this season is going to be a really nice one." Each year, he said, the trees follow the same pattern as the green chlorophyll ebbs from leaves and reveals the colors below. The first to "pop" are usually the red maples, which erupt in a dazzling show of deep crimson. Then come the pumpkin-colored sugar maples, the golden birch and the light-tan beech. The season ends with the ruddy brown shades of oaks. Now, from the other side of Round Mountain, a group of five young hikers, outfitted with aging frame packs and with foam sleeping pads, crested the summit. They had stayed the night before at a backcountry campsite along Ashley Brook and had hiked to Mount Frissell that day. Judging by the sweat pouring from their brows and their brisk clip, they were in a hurry to get home. "The campground is quiet," one said, as he plowed through a patch of blueberry bushes with red-tinged leaves. "It'll probably be deserted tonight." Some three-quarters of a mile beyond Round Mountain on the south slope of Mount Frissell, the trail climbs to the highest point in Connecticut, a humble 2,380 feet (the mountain's actual summit, at 2,453 feet, is in Massachusetts). A little farther, the trail led past a stone pillar similar to the one off East Street, but this one marked the convergence of three states — New York, Connecticut and Massachusetts. These days, hikers can join hands and step around the monument like dancers circling a maypole, delighting in the novelty of three states only a footstep apart. But only three sides of the rectangular pillar are actually engraved: on the north and eastern sides with the word Massachusetts and on the western side with New York. Connecticut's uncarved face has to make do with the state's name scrawled in black marker. "The state was too chintzy to pay for it," explained Bob Estabrook, the town perambulator for nearby Salisbury, Conn. At the time the marker was placed in 1898, "the funds got tangled up in the legislature and never came through," according to Mr. Estabrook, whose duty, he said, "is to walk the township boundaries every five years to watch for acts of aggression from New York and Massachusetts." On a bare windswept ridge about 2.2 miles into the hike, the Mount Frissell Trail meets the South Taconic Trail. There, the route turns north toward Alander Mountain, the third and final peak, and a hand-painted sign is marked with destinations, distances and arrows. A windsock hangs from the bald summit of neighboring Brace Mountain, and views extend well into the Hudson River Valley of New York. Directly below, some 1,400 precipitous feet, a stand of well-tended farms gather around the glittering Noster Kill. Farther west, the valley rumples like an old bedsheet to end spectacularly at the rampart of the Catskills spiking up along the horizon. Miles go quickly on the well-maintained South Taconic Trail and soon the path on the ridge morphed into a path in the forest. Golden birch bowed over the trail creating a multicolored tunnel of fluttering leaves and dappled light. Late in the day, Holly Nelson and Brad Vogel were on their usual afternoon stroll from their home in nearby Millerton, N.Y. "We just got back from Norway last night, and we had to come up here," said Ms. Nelson, who along with Mr. Vogel runs tours to Europe. "We make it to all these beautiful places, but this is still as good as it gets." Mr. Vogel, who said he has lived in the area "since the Eisenhower era" and wears a beard woolly enough to make Walt Whitman proud, is a student of local history. As hard as it was to imagine, Mr. Vogel maintained that the Taconics' landscape was once very different from the pristine woodlands of today. The portion of the South Taconic Trail where he stood was cut from an old charcoal-makers' road, he said, and the now tree-covered hillsides were once laid bare and smoking with charcoal pits. The most significant event in the Taconics' recent years was quite possibly in 1732, when high quality iron ore was discovered in the nearby town of Salisbury, Conn. Championed as the highest-grade iron in the world (admittedly by somewhat biased local sources), the ore ignited an industry that furnished the bulk of guns and munitions for the Revolutionary War, the War of 1812 and the Civil War, according to "The Changing Landscape, " a regional history by Christopher Rand. The effect on the surrounding forest was drastic. As the call for iron increased, legions of colliers took to the woods to produce charcoal, a necessary ingredient for smelting iron. The ancient hardwoods were harvested at a rate of roughly 600 acres a year, leaving the hills bare by the mid-19th century. At the same time, sheep pastures were being established on some of the newly cleared lands, evidenced by the aging stone walls that occasionally crop up along the South Taconic Trail. But by the end of the Civil War, things changed. The iron boom died and a blight of foot-and-mouth disease wiped out the merino industry. In their wake, the forest returned. The final climb of the day was up the western face of Alander Mountain. Steep and devoid of switchbacks, the ascent paid off with a fiery sunset seen from the summit's slabs of rock. To the south, the entire Taconic ridge stretched out like a calico cat. Deep autumn colors deepened further still in the late day light and it was time to go. Somewhere below in the fading light there was an empty campsite set next to a rushing brook with a deep fire pit. And there was camp food to be cooked— red beans and rice. And of course, there was the promise of doing it all over the next day. TO get to Mount Washington State Forest (www.mass.gov/dem/parks/mwas.htm) from Great Barrington, take Route 23 west to Route 41 south, then make a right after 50 yards onto Mount Washington Road. The visitors center, which is closed for the fall and winter, is eight miles south, and the Mount Frissell Trail begins three miles farther on the same road, renamed East Street. The Mount Frissell trailhead is marked by a dirt lot on the west side of East Street about 50 feet north of the Connecticut-Massachusetts line. The trail is blazed in red and is the only one that starts from that lot. Camping in Mount Washington State Forest is first come first served. Visitors can come at any time, though staff members are there only in the spring and summer. There are a number of backcountry sites spread over a half-mile on the Ashley Hill Trail about 1.5 miles from the visitors center. There are no facilities beyond fire rings and pit toilets, and the nicest sites are along Ashley Hill Brook. There is no fee for either backcountry camping or day hiking. From Route 22 in New York, the South Taconic Trail can be reached from Taconic State Park at Copake Falls at Undermountain Road and Whitehouse Crossing Road. In Great Barrington, Butternut's Outdoor Sports Store (413-528-7737; www.expeditionssportsshop.com) carries camp food, tents and maps.